So, this is a project I’ve been thinking of making for a little while. I just had to get up the nerve to try it. You see, I can’t bear to throw away scraps of fabric that are left over from various sewing projects. Unless they’re itty bitty, I usually keep them. 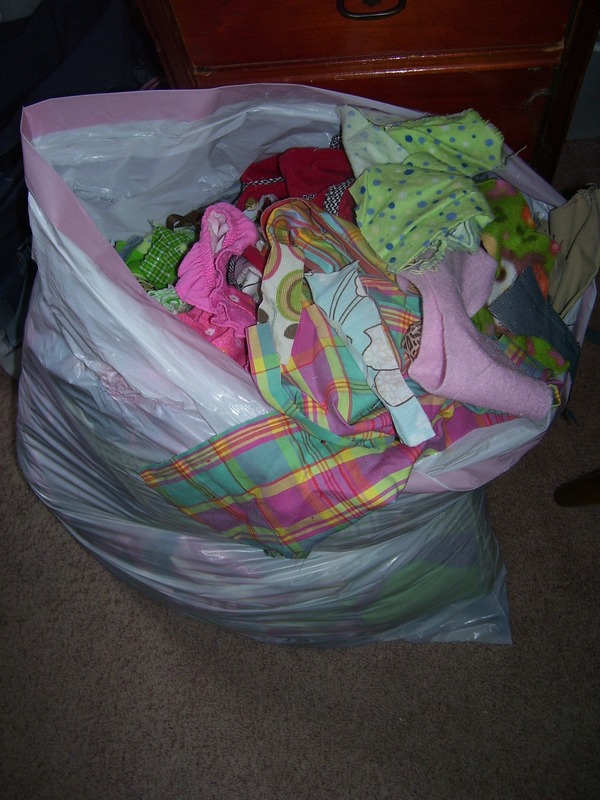 The problem is, I now have a huge bag full of scraps–everything from flannel, cottons, denim, sweater pieces, you name it. And there’s a huge variety of colors and patterns too. 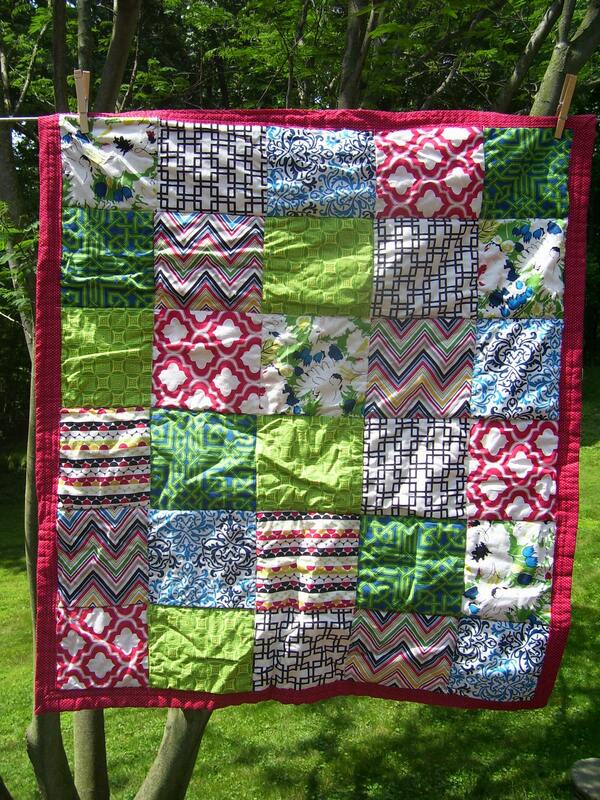 I’ve tried my hand at some basic patchwork quilts that were very matchy matchy, but had never thought of making a crazy quilt. One of my previous creations. *Cut muslin into 12″ by 12″ squares. How many you cut depends on how large you want your quilt to be. 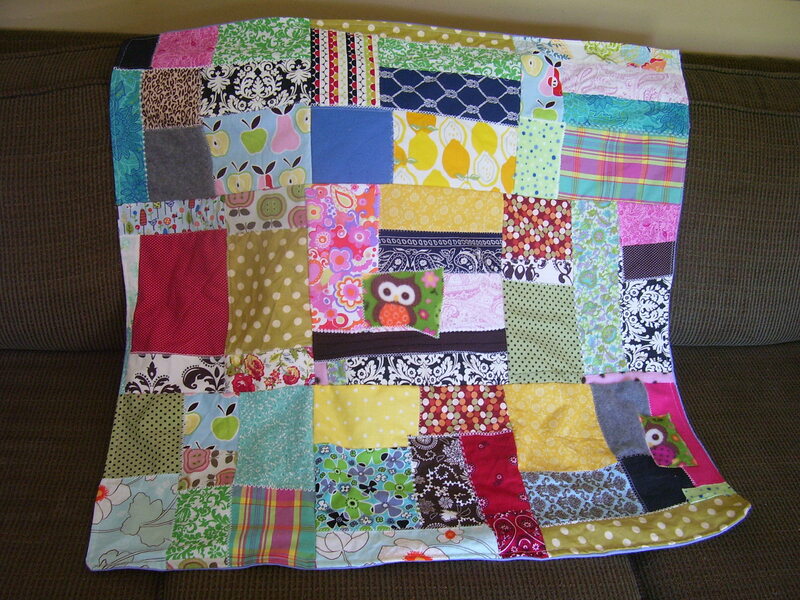 For example, I wanted to do a 36″ by 36″ quilt, so I cut out 9 of these squares. 12" squares of muslin. If you don't have muslin, I'm sure a plain colored cotton would work fine. My eyesore of a scrap bag. I literally dumped it all out to sort through my scraps. Though messy, it was fun to look and remember what projects I used certain ones for. 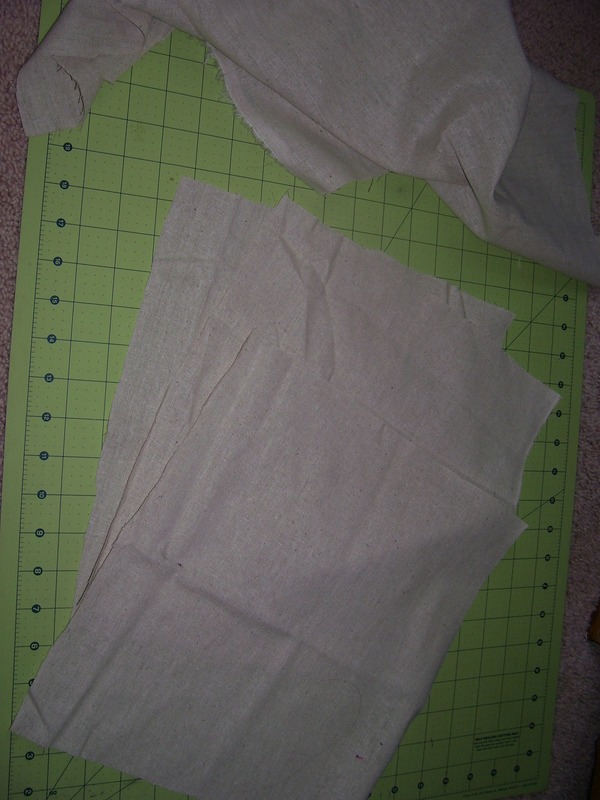 *Starting on one 12″ block of muslin, lay down one scrap of fabric anywhere on the square, right side facing up. Choose another piece to go beside it and lay it right side down on top of the first piece with one edge of each lined up. 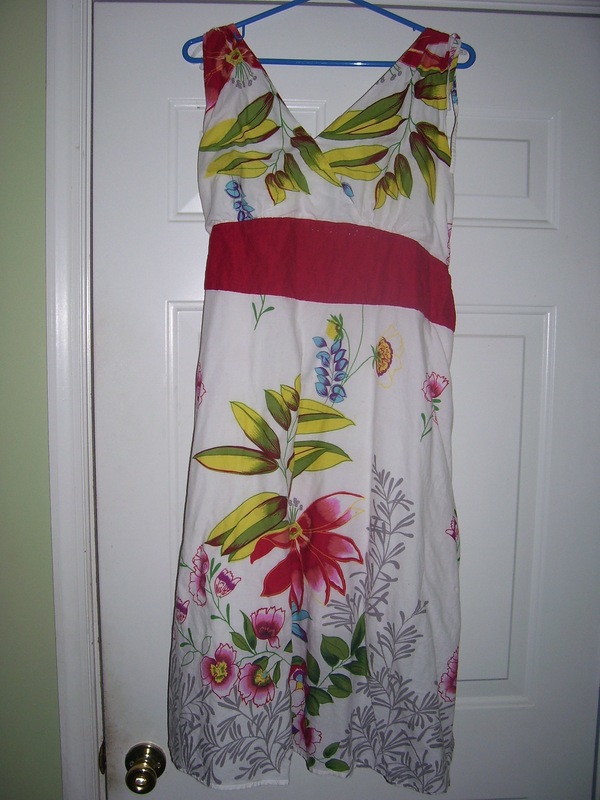 Sew through all 3 layers of fabric (both scraps and the muslin) and then flip the upside-down one over. 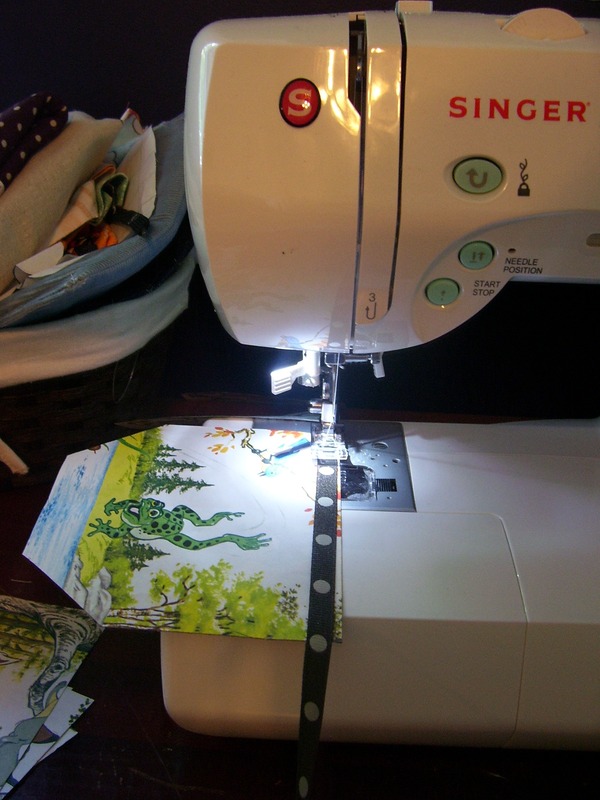 This is called the “Sew & Flip” method. Not the greatest pic, but hopefully you can tell that one piece is right side up and the other is facing down with one side of edges lined up. *Choose another scrap piece and follow the same method using one of the free edges. Keep doing this until your square is filled up. 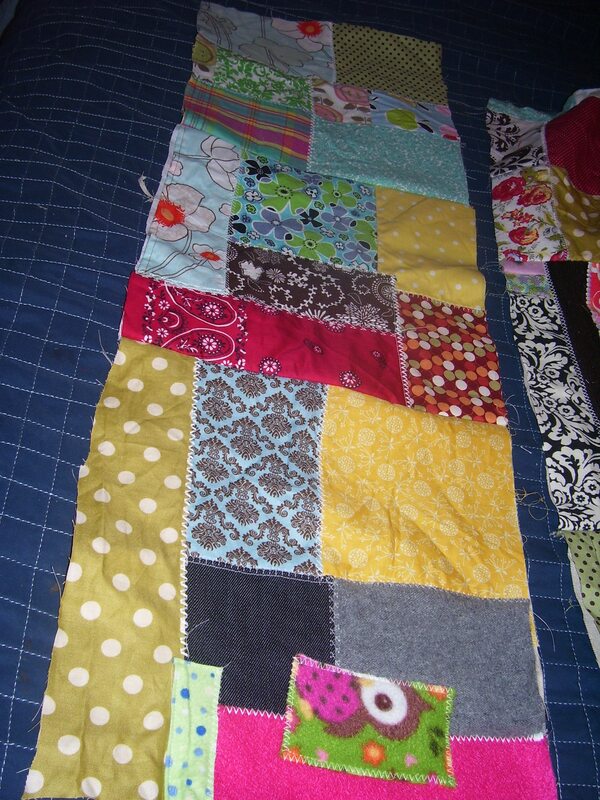 Flip the square over and trim any excess pieces that hang over the edges of your square. 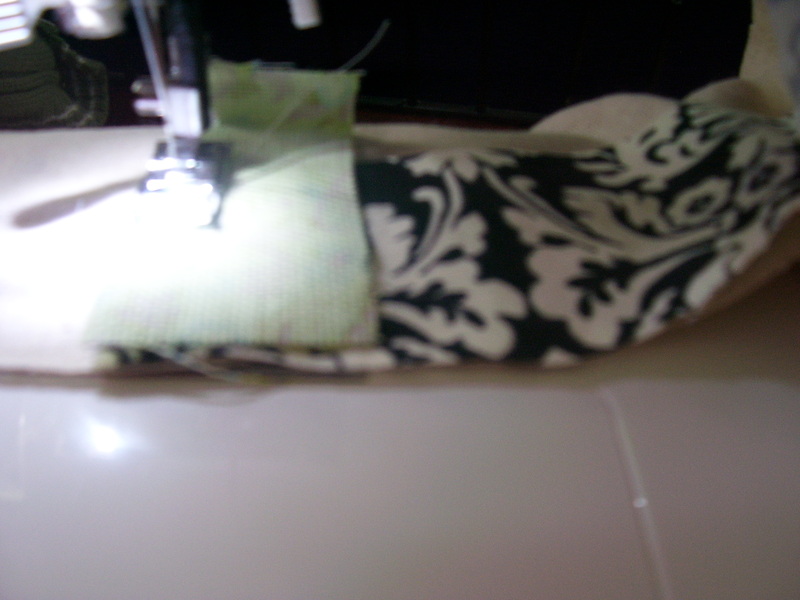 *Sew over each seam using different types of stitches. I used all white thread for mine, but using different colors would add lots of visual interest to your piece. I also played around with some of the fancy stitches on my machine, using ones I don’t normally stitch with. *Fill all squares up using the same method. *Arrange finished squares in a way that is pleasing to you. 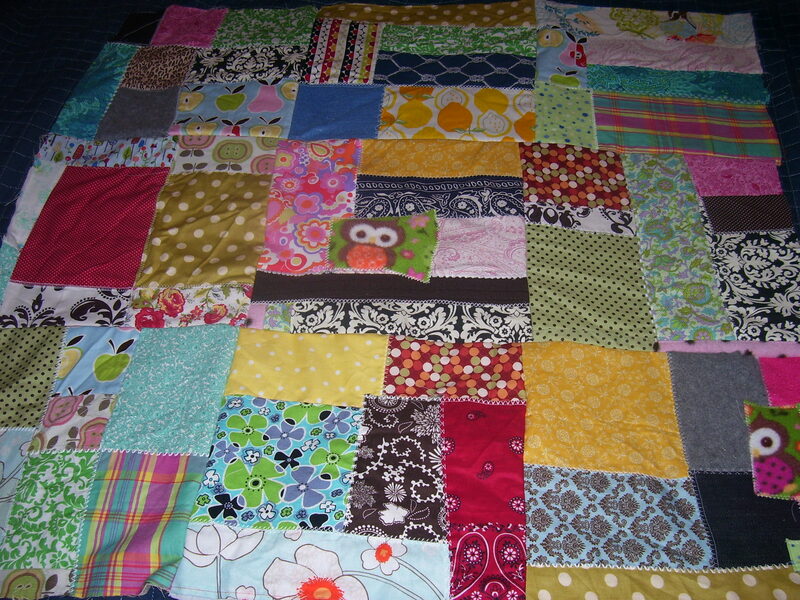 *Sew finished blocks together, row by row until quilt top is completed. One row of 3 blocks. *Cut a piece of fabric to use as the backing. You do not need batting for this project! Sew the top and bottom pieces together. 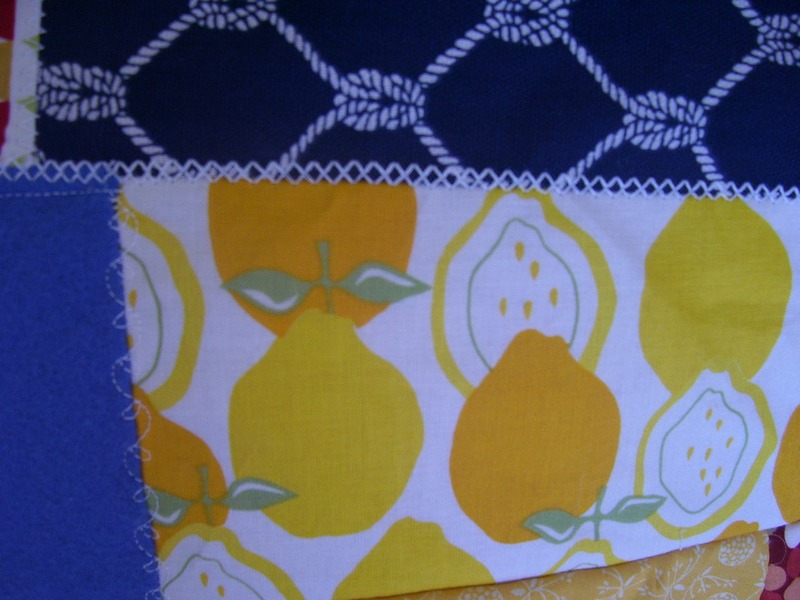 Since I wasn’t using quilt binding around the edges, I sewed these with the right sides together, leaving about 3″ open. Then I flipped the whole thing right side out. *Top stitch all around the edges (making sure to seal that open 3″ area), or sew binding on around the edges if that is what you prefer. *Stand back and admire your new piece of artwork!! The end result. I might be biased, but I think it turned out cute. Preheat oven to 350. Line a baking sheet with parchment paper. 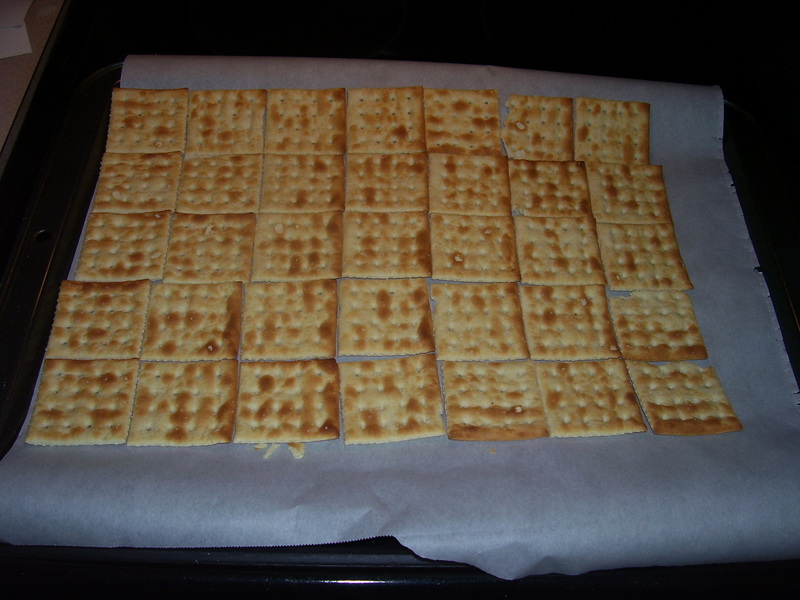 Place saltines side by side on the parchment until it is covered. 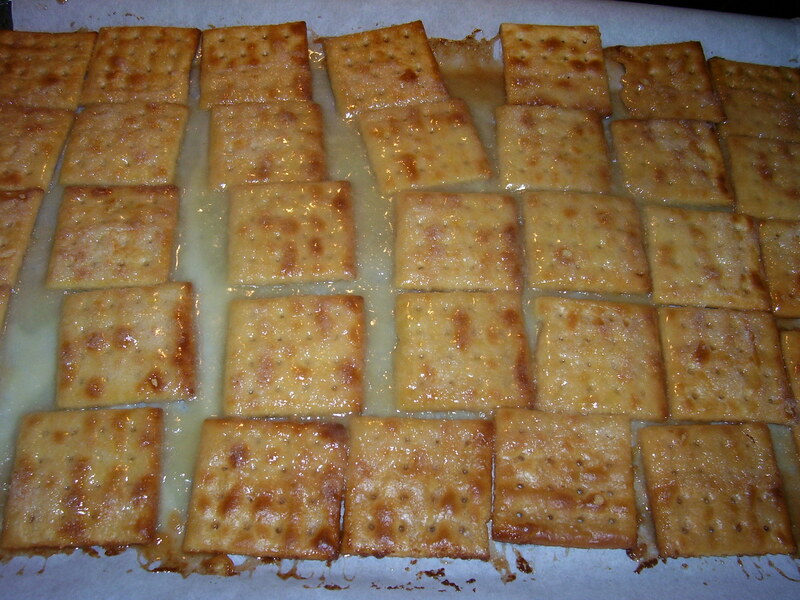 Melt butter and sugar together and pour over the saltines. Bake for 10 minutes. 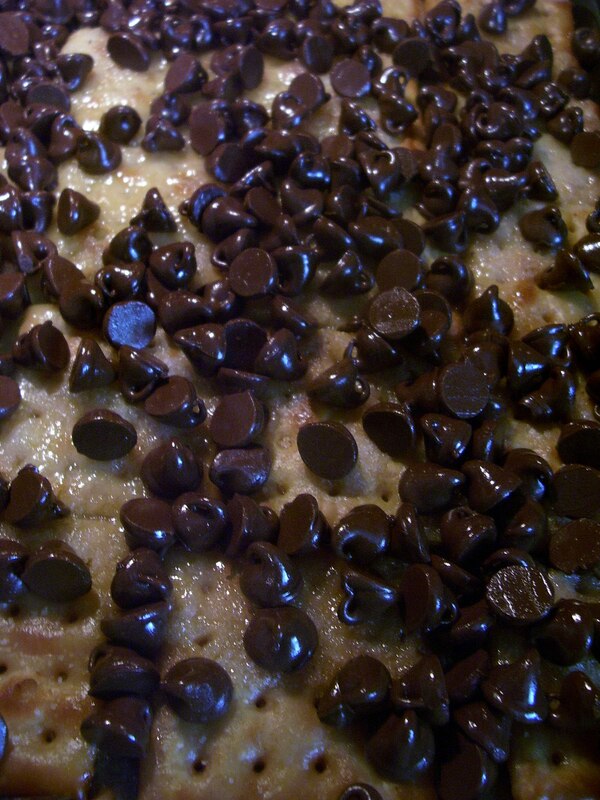 Sprinkle on chocolate chips and return to the oven for 1-2 minutes so the chocolate chips will stick to the crackers. Refrigerate for at least 2 hours, then break apart before serving. I used regular sized chocolate chips for this batch, but the mini size actually works even better. Another variation that I have seen is to melt the chocolate chips entirely and pour in a layer over top of the crackers, then chill. Bon Apetit! 1. Hang laundry out to dry. I’ve read that it costs 50 cents to over $1 to run one load of clothes in the dryer. 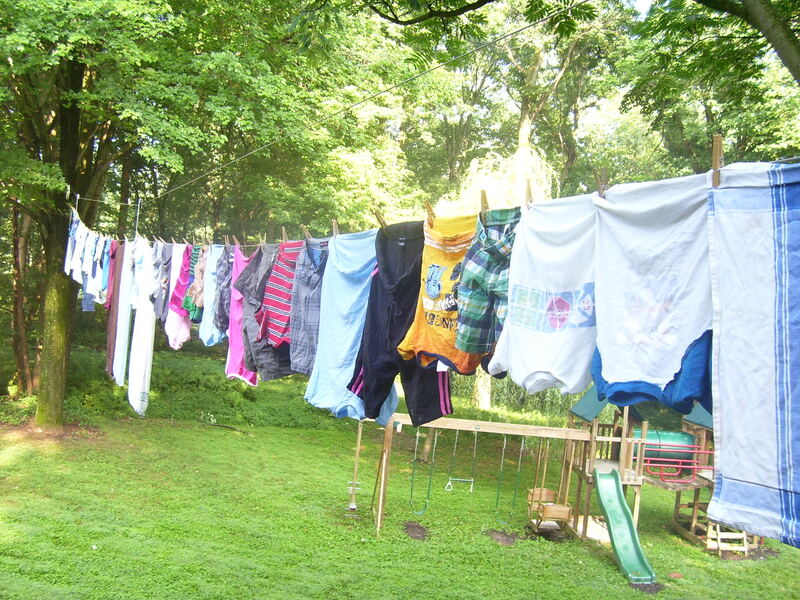 One of the best things my husband has done for me over the years is set up this pulley-style clothesline (or in our area, called an Amish clothesline) that runs from our deck landing to a tree. I can literally stand in one spot with the wash basket and clothespins and hang out all the wash. For our family, it holds about two days worth of laundry. Not only is this a more green way to dry your laundry, you will save money on your electric bill by not running the dryer. With the exception of refrigerators, dryers eat up the most electricity. Except in the wintertime and very rainy weeks, this is what I try to do. As a bonus your laundry smells great and has a crisp feel. 3. Make my own laundry detergent. One of my first posts featured the recipe I use for this. 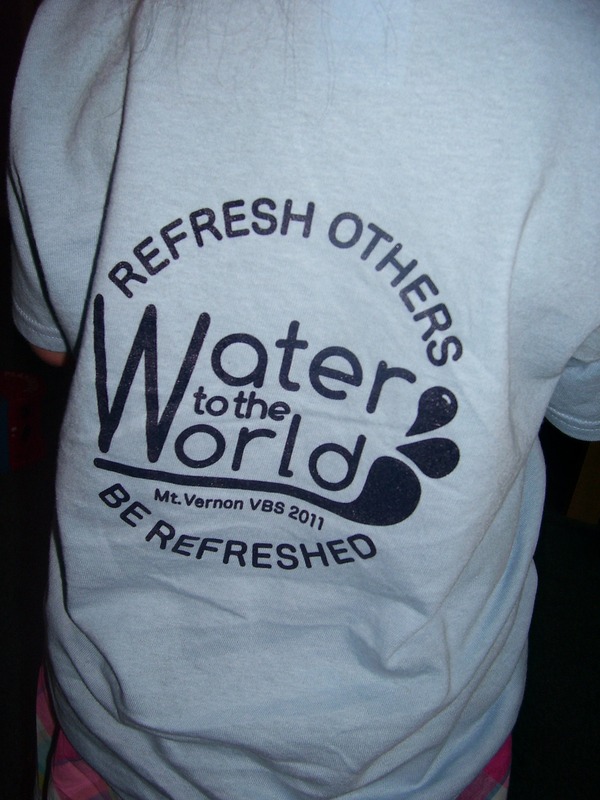 I make the liquid variety which usually lasts us for several months and costs less than $2 to make. (And it works great!) Occasionally I will buy some, but only if I see a really good deal and have a coupon for it. 4. Clip coupons. Up until last year I thought coupons must be a waste of time. Then I kept hearing about and seeing all these people who swear by couponing to save on their grocery bill, among other items. I subscribed to the Sunday paper, started clipping, and haven’t looked back. 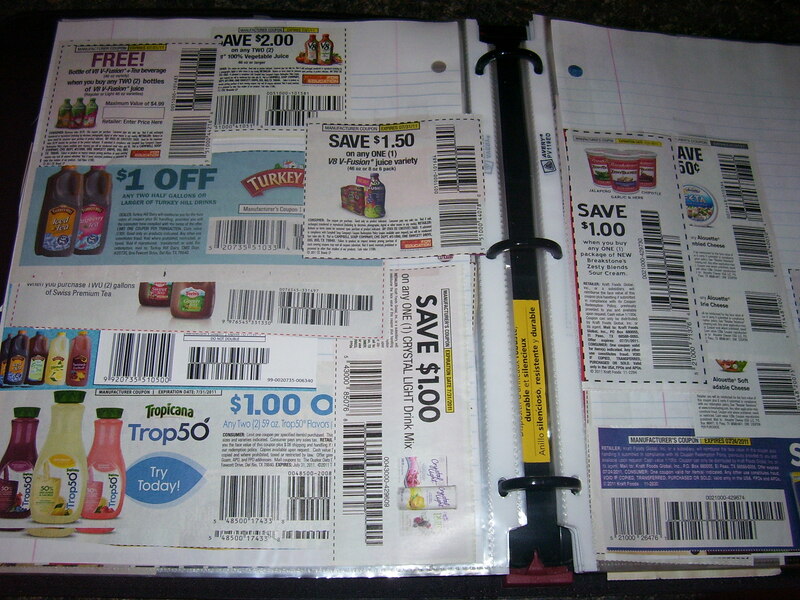 Yes, it does take a bit of extra time to clip and shop with coupons. However, I find it to be well worth the effort. And no, in case you’re wondering, I’m not one of those crazy people who stock up on like 50 bottles of mustard just because I have a million coupons for them. Some of my favorite websites dedicated to couponing: moneysavingmom.com, forthemommas.com, couponmom.com, hip2save.com, and thefrugalgirls.com. 5. Make dinner homemade. Eating out is oh-so-convenient if you’ve had a hectic work day or are running kids from one activity to another. However, just taking everyone to Mickey-D’s can really add up. We like family dinners at home whenever possible, though it’s fun to splurge once in a while. Plus it’s so much healthier to eat homemade and having time around the dinner table as a family is priceless. 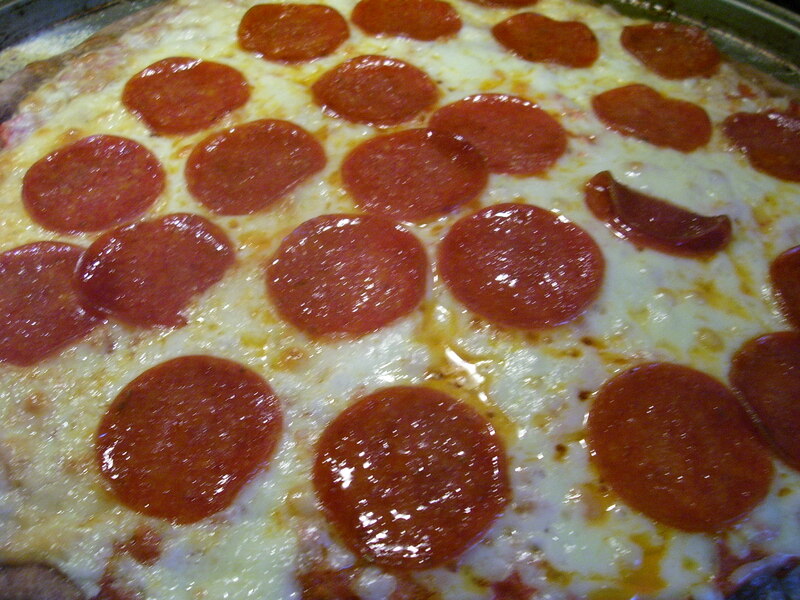 Dinner last night--Mom's homemade thin-crust pizza. 6. Leftovers please! I still remember my brother talking in disbelief of a family that he discovered threw out all their leftovers every night. What a waste! We usually indulge in leftovers for our lunch and if we have quite a few left, on hectic days, I will serve up a leftover smorgasboard for dinner. One of my favorite blogs, thefrugalgirl.com, does a post on food waste every week to challenge others to reduce food waste. Using up all your leftovers also saves on those grocery bills. 7. Cut our boys’ hair at home. Little kids’ haircuts can run anywhere from $5-$10, sometimes more at a barber shop or hair salon. My husband has cut his own hair with a pair of clippers for many years and we do the same for our boys. Daddy is the barber and lines all 4 of ’em up in the bathroom. They even have a contest to see who is the most shaggy. I’ve also cut my daughter’s hair many times at home and get mine cut every couple of months, just a cut and no other services. One of the twins getting clipped the other night. 8. Buy secondhand. 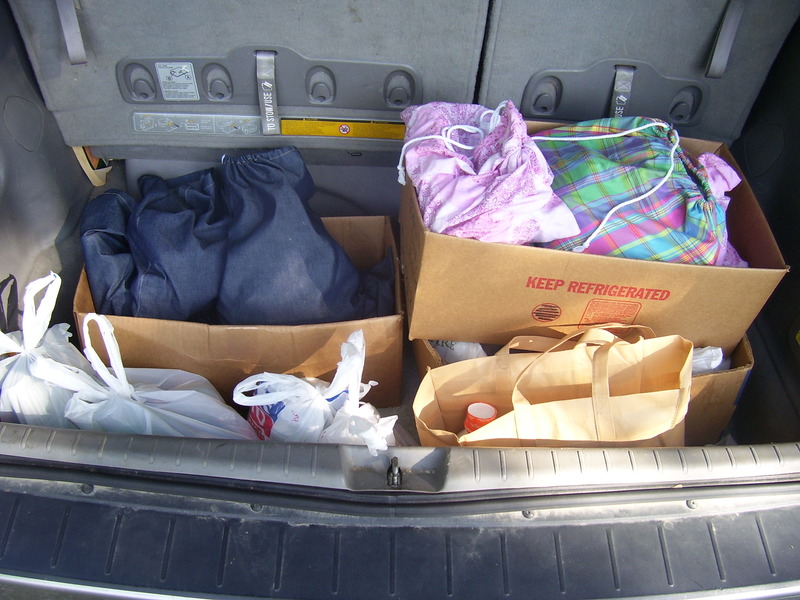 If you’ve read even a few of my postings before, you know I love to shop secondhand. Hey, I find really great stuff for my family this way and figure I pay a small percent of what I would at a department store. Just as an example, several months ago I was wanting to buy different curtains for my daughter’s room. Hers were still pretty babyish and I was on the hunt for something a bit more grown-up looking. I happened to be at Goodwill looking through the household linens and found a pair of awesome purple curtains for $2 that just needed to be hemmed. Ebay and Craigslist are also great sources if you’re looking for something specific. 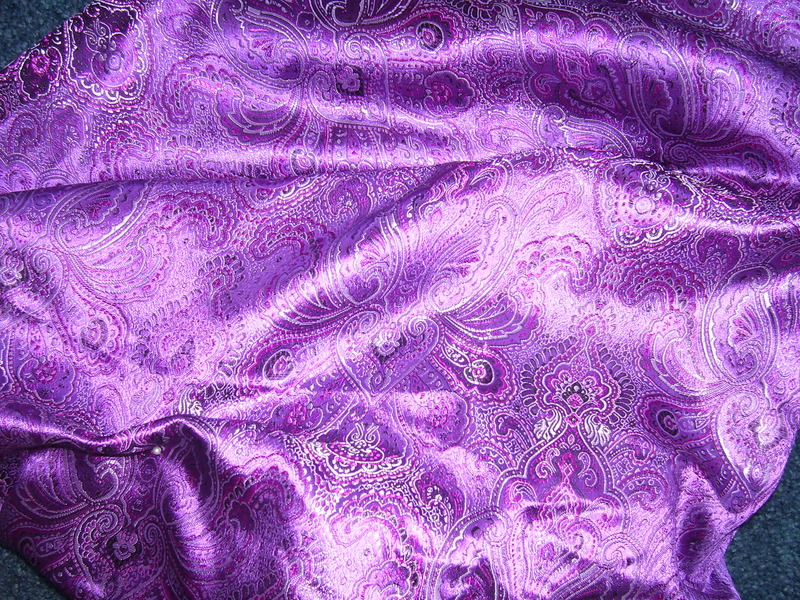 Part of Heidi's purple paisley curtains, one of my Goodwill finds. 9. Take advantage of the season. I feel so incredibly blessed when I open up my freezer or go down to my basement and see the plethora of fruits and veggies we have canned or frozen for the year. 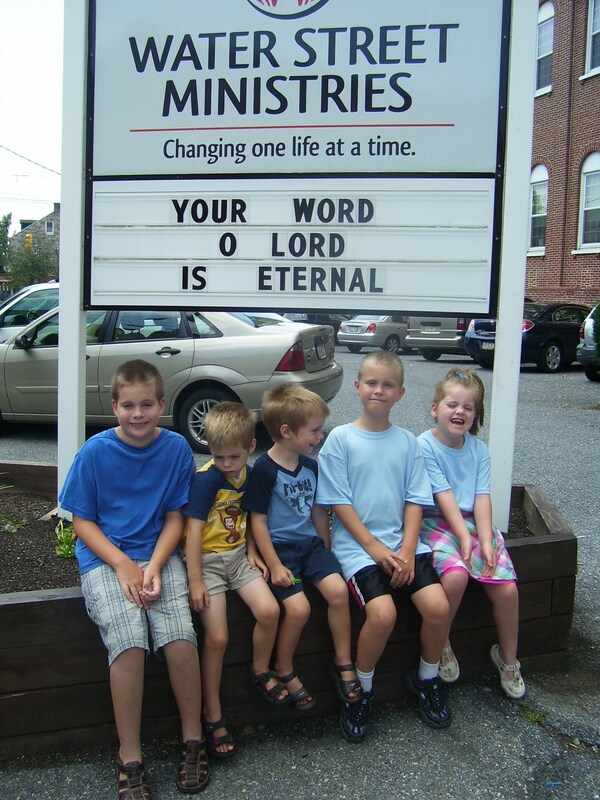 We usually make this a family event and get the kids in on the action. As they get older they really can be good helpers and learn to appreciate where their food comes from. 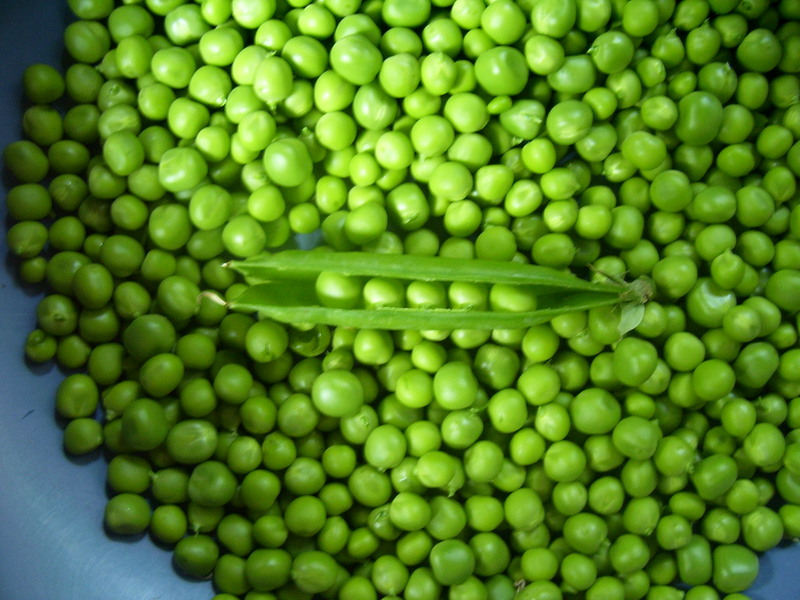 Some of the items we regularly can or freeze: sweet corn, peas, lima beans, green beans, peaches, applesauce, tomato sauce, whole tomatoes, salsa, grape juice, jellies and jams (all kinds)…. 10. Don’t pay for TV. Really, is there anything good on anyway? We stick to the old-fashioned antenna and are quite content with that. Mostly the kids watch PBS and a couple evenings a week there’s a show or two we may watch, but that’s about it. 11. No gym membership. I have comfy sneakers, a bicycle, weights, an exercise mat, balance ball, and some exercise DVD’s. Honestly, if I can’t get a good workout with those items around it’s my own darn fault. 12. Programmable Thermostat. This is something my husband just installed at the beginning of last winter. I think it cost around $30 and you can set it anyway you want during the day and night. I can’t pinpoint how much it saved us yet, but from what I’ve read it can really help you save on heating and cooling costs. 13. Basic cell phone. I tell people that I have an old person’s cell phone. Actually, I sorta do. It has the most basic functions and no bells or whistles. I’m sure if I got something new and fancy-schmancy I would probably enjoy it, but so far that hasn’t been necessary for me. And, can I be quite honest here? I am annoyed by people constantly chatting, texting, and whatever else on their phones. I know, I know, I sound like an old fuddy-duddy. Mine is about $10 a month which suits me fine and my husband gets his provided through work. So, I’m curious, how does your family save in this crazy economy? I would love to hear from you! Banbi & Friends displayed in a whole new way. 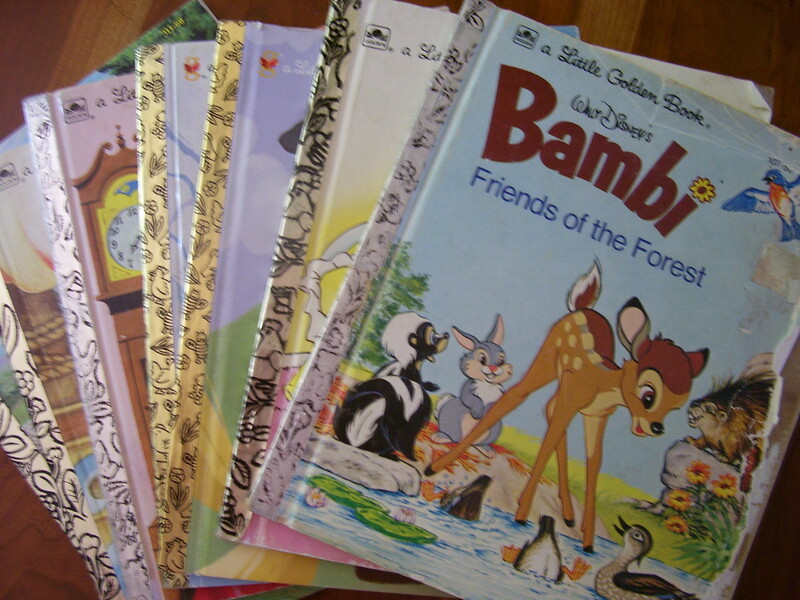 Part of our Little Golden Book stash. 1. Choose a book that you want to use. It doesn’t have to be a LGB, just one that has great pics that take up a good part of a page each. 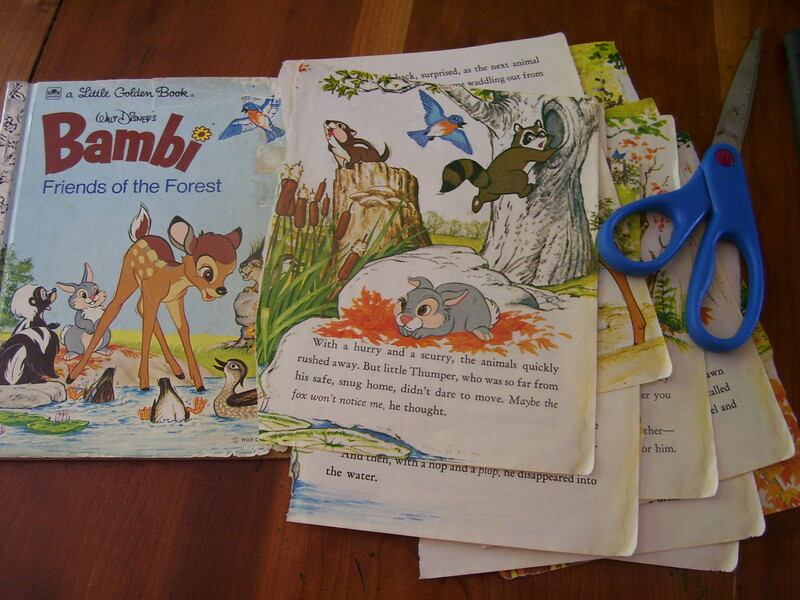 Vintage kids storybooks would be a fabulous option, as long as the pages aren’t too thin. 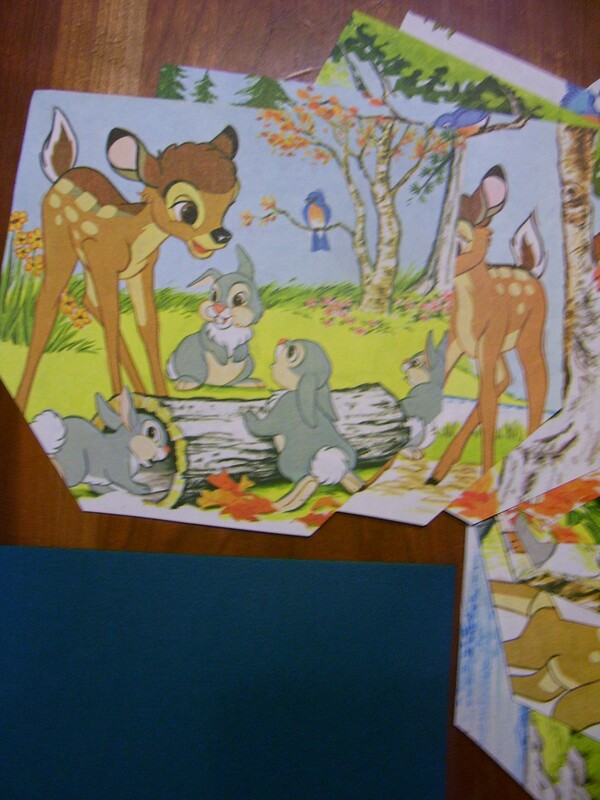 The Bambi book minus its pages. 3. Choose a shape you want your pictures to be. I chose this sort of pocket shape because it didn’t leave out good parts of my picture. To make things easier, cut a template of the shape out of heavy cardstock. Trace and cut for each one of your pages. Putting my good ole' Singer to work again. 4. Choose a ribbon (I used a polka-dot grosgrain) to connect all of your shapes together. Mine used an entire 3 yd spool, but really you could make it any length you want. Make sure to leave a tail at each end for hanging. 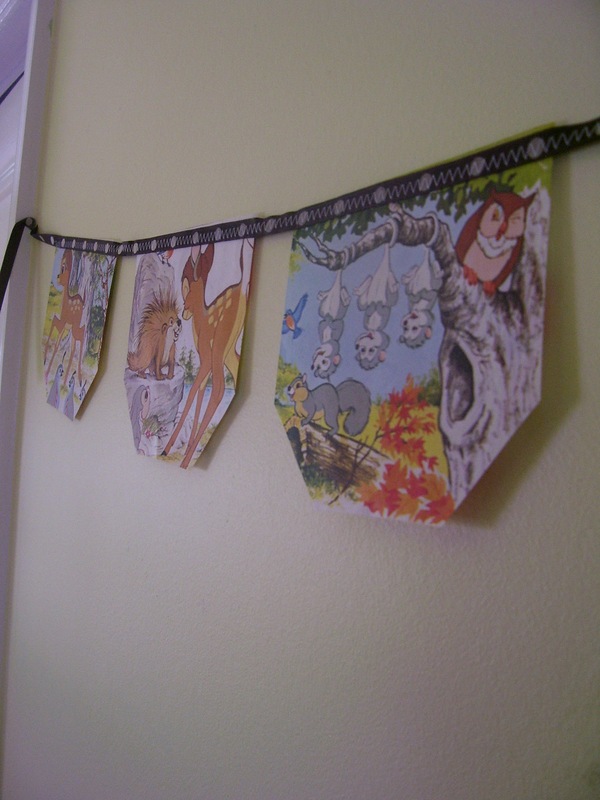 Since I was sewing mine on, I pinned them onto the ribbon beforehand so they were spaced out properly. To my non-sewing readers: a hot glue gun to connect everything would work just fine too! 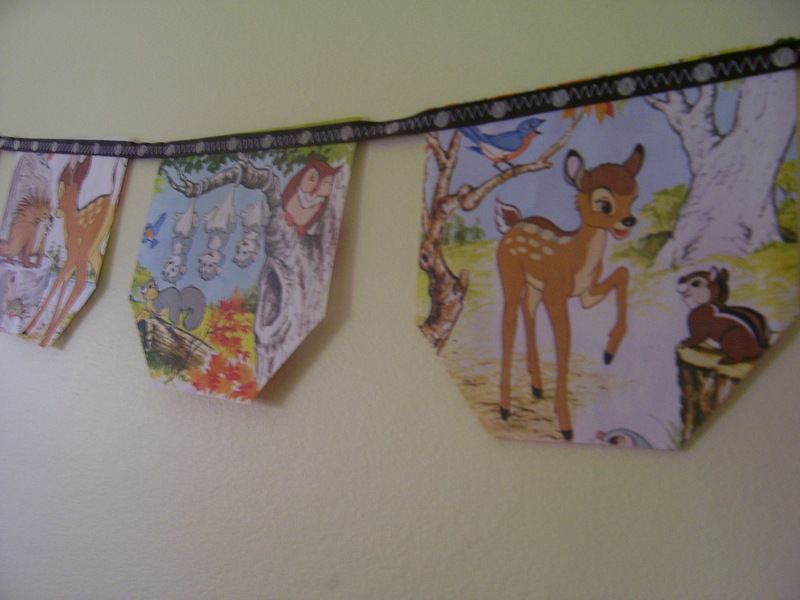 If you are sewing these on, I used a zigzag stitch from one end to the other. I love, love, love me a good yard sale. Or flea market. Or thrift shop. Or clearance rack. You just never know what you’ll find for sometimes mere pennies compared to what you would pay for the same item new at a department store. Recently I wore this dress to church and got tons of compliments. 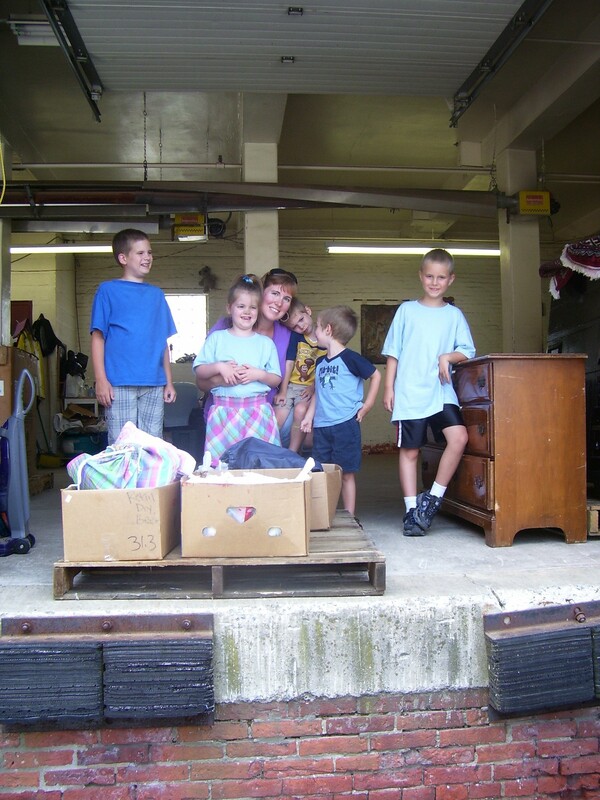 I happily told them that it was purchased at Goodwill for a few bucks. (It’s handmade, by the way.) I also wore a necklace/earring set that matched it perfectly–found at a yard sale for $1. In fact, probably at least 80% of what I wear anymore has come from a yard sale, Goodwill, other thrift shop, etc. My husband and kids too. I wasn’t always that way. In fact, I sort of cringe to think what I could have saved over the years had I shopped this way before. Now, I thought I would share some other thrifty finds I have happened upon lately. 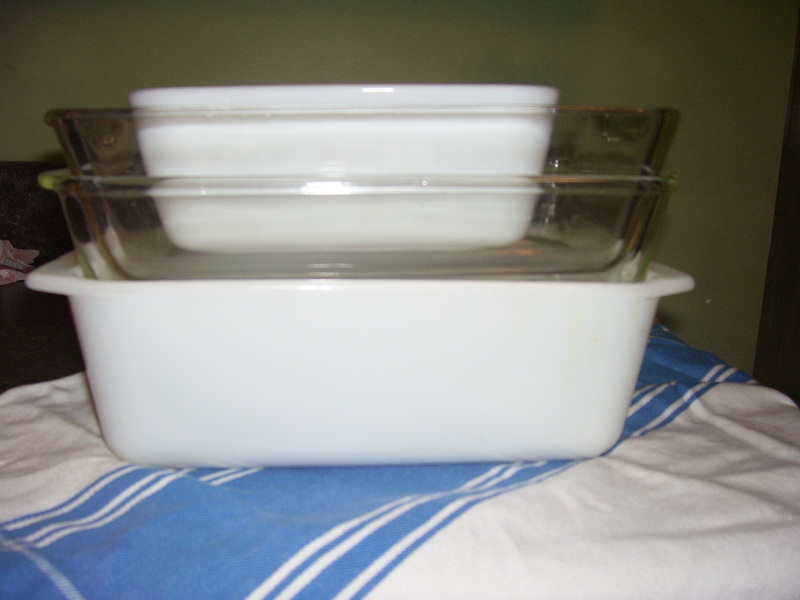 Next up–these glass loaf pans. I have been scooping up some of these as I see them at yard sales as I am trying to get rid of my old non-stick metal ones. They have gotten yucky with the non-stick coating worn off and I would prefer glass. Oh, and they were all 25c to $1 each. 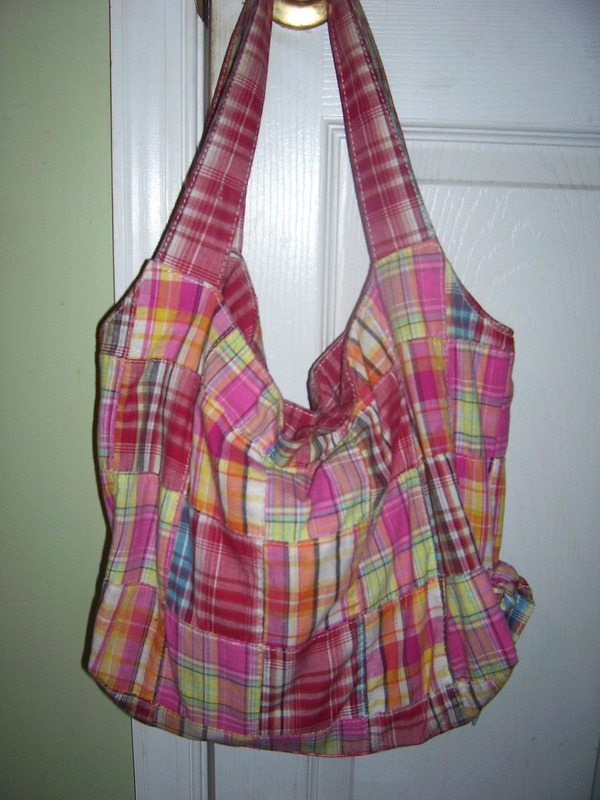 I happened upon this madras plaid purse at a yard sale for $1 and couldn’t resist. Wanting something a bit more summery, it was calling my name. Plus it’s plenty roomy, has long enough straps, and matches almost anything. 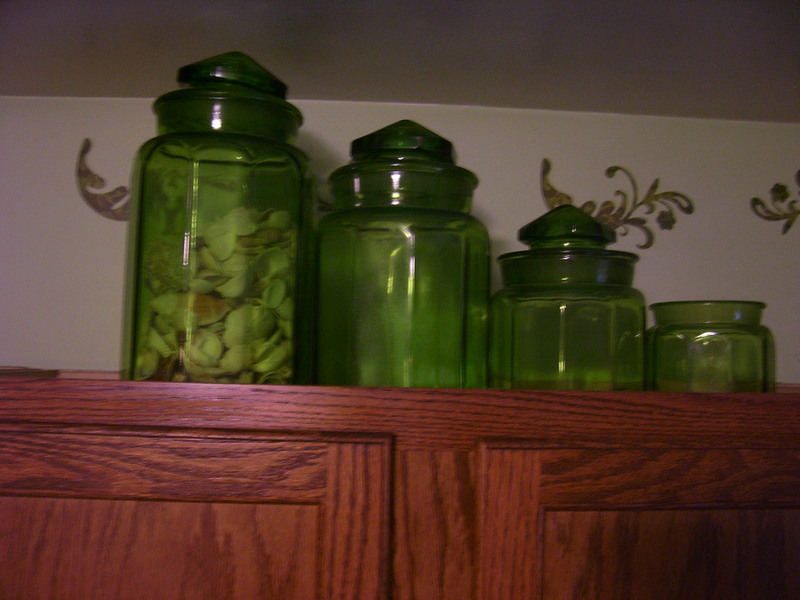 My kitchen has been green for the past probably 7? years, and I still love it. Our church held a yard sale to benefit the youth group and one of the ladies donated this awesome olive green canister set. At first I didn’t buy it, then it didn’t sell and my husband went back and got these for me. These weren’t as thrifty since he made a “nice” donation as it was for a good cause. However, I couldn’t help putting it in this post. Inside the largest one is seashells that the kids collected from our Florida trip. 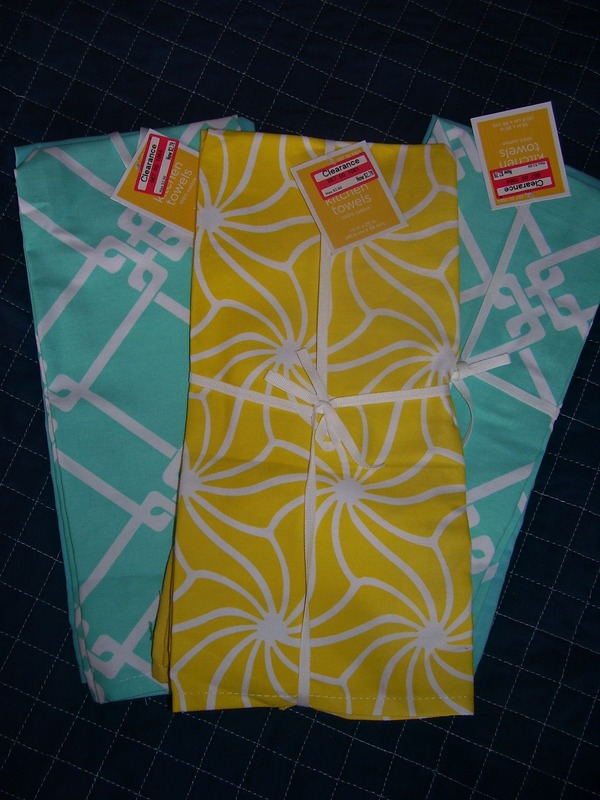 These bright, fresh kitchen linens were found at Target in the housewares clearance. Each is in a pack of 2 and the clearance sticker read $2.38 for the pack. I may repurpose these into something else, so I swiped them and they ended up being less than $2. Two more yard sale finds. We had been talking about getting a globe for the kids, so at $1 I had to pick this up for them. 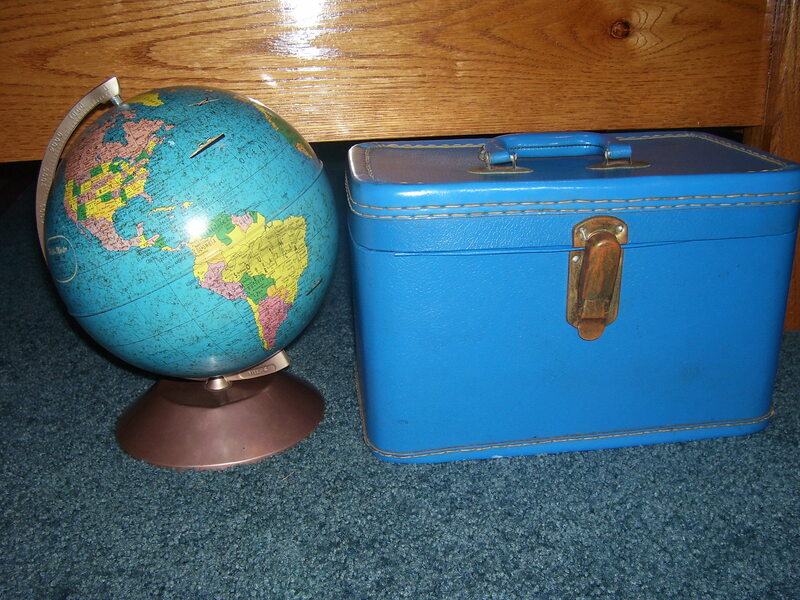 I couldn’t find a date on it, but we’re guessing from the different geography clues that it may be from the 50’s. Last but not least is this cool blue little case, also $1 I think. The kids have been using it to carry their stuffed animals and such in, but I just adored the color.